In many countries worldwide, the topic of energy transition seems to be highly charged. The array of challenges connected to this process embraces a clash of worldviews, controversies over the efficiency of existing technologies, legitimacy and quality of planned and implemented policies, disputes over the “right” energy mix as well as other complex economic and social issues. Yet, the transition will inevitably have to be introduced soon, and both the process and the time framework of the change are the key to success. To add to this heated discussion and to suggest a way forward, the Centre for Systems Solutions, in collaboration with Wuppertal Institute and Thema1, has developed the Energy Transition Game. The activity can be described as a social simulation—a type of face-to-face serious game for a large group of people that engages them in mock negotiation, confrontation and decision-making. In this particular case, participants step into the shoes of ministries, energy producers, technology startups, energy providers, and NGOs. Thrust into the harsh reality of the energy transformation, they don’t only have to deal with the associated technical complexity but also learn to manage complicated relations between each other’s conflicting ideas and agendas. What they discover, wading through a seemingly endless list of emergencies to address, is that transformation is not a lonely business and, to lead it successfully, they have to step out of their silos and start working together. This revelation does not come instantly, of course. At the beginning many players are motivated mostly by personal gains. For example, in the initial rounds, energy producers often show no interest in the natural environment protection, investing in facilities that can ensure them stable profits rather than relying on uncertain sun- or wind-dependant energy sources. Such an attitude usually meets with severe public censure. NGOs’ representatives call for financial sanctions against such practices and demand more sustainable solutions being introduced. However, green technologies proposed by technology start-ups are often counter-effective, as they still depend on outdated infrastructure. This, in turn, has to be addressed by the government that – as you may suspect – doesn’t have enough budget to modernize it. So what is their strategy? Raising energy prices! And this is how the vicious circle continues. 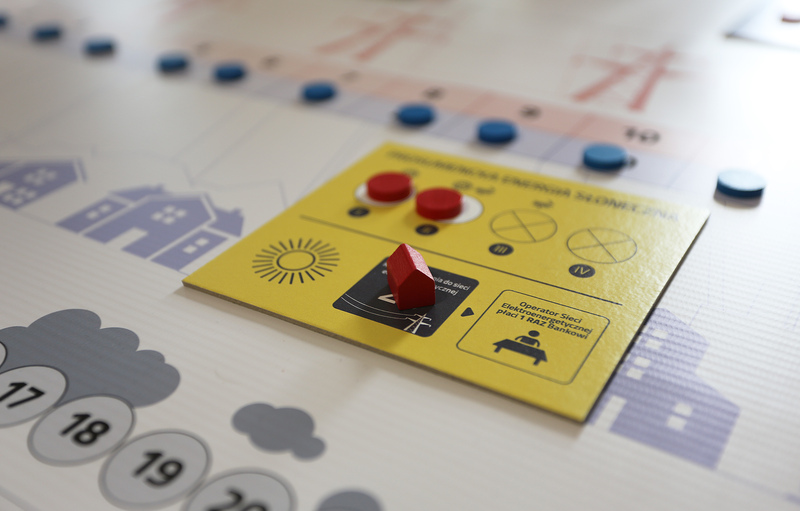 With its lively dynamics, The Energy Transition Game gives room for collective problem solving and testing available options with their associated impacts on economy, ecology or society. The in-game world’s mechanisms mirror the most important features of our real world, making it easier for players to draw meaningful conclusions that may be furthered applied to solve real, not only simulated, challenges. For example, when played by policy makers, it may help them anticipate potential trade-offs and delineate possible mitigation measures. How? By simply experiencing them, either through the games’ mechanics or through other participants’ feedback. Unlike in real life, however, such testing is safe and not linked to any fatal repercussions. It may thus serve to chart a desired course of action and prepare for plausible stumbling blocks. For this purpose, the Energy Transition Game has been successfully used at multiple workshops organized, among others, with Estonian Ministry of Environment, German Environment Ministry, Wuppertal Institute, Climate-KIC, Systems Innovation Lab. Green technologies proposed by technology start-ups are often counter-effective, as they still depend on outdated infrastructur. On the picture: a card representing prosumer solar energy production. Although the simulation was designed to depict the problem of energy transition, it can also be used in other contexts. For example to address technical and social aspects of complex processes, such as multilateral agreements or coordination of joint initiatives where stakeholders of different backgrounds and values meet, etc. The Energy Transition Game encourages ‘out-of-the-box’ thinking, negotiation and mediation skills. By and large, it is a great tool to display problems and dilemmas emerging from complex, coupled systems that encompass environmental, social, economic and technical elements and interactions between them.